I hope your favorite furry friend enjoys these as much as Einstein did! 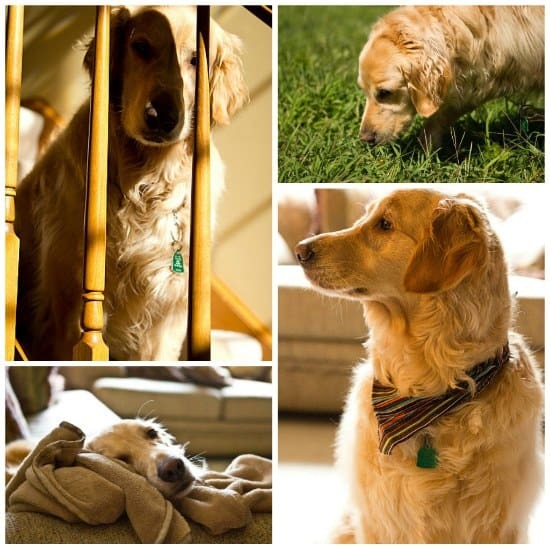 Here are a few of my favorite pictures of him over the last year…. Happy Birthday buddy! You rock! 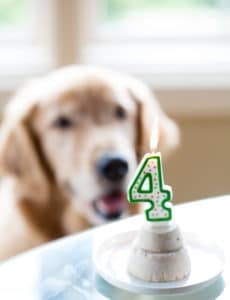 One year ago: Apple & Cheddar Pupcakes for Einstein’s 4th Birthday! Four years ago: Happy 1st Birthday Einstein! Preheat oven to 325 degrees F and line two baking sheets with parchment paper or silicone mats; set aside. In a large bowl, pour the boiling water over the oats and butter. Stir briefly and let stand for 10 minutes. Add the cornmeal, sugar, beef bouillon, milk, cheese, and egg to the bowl; mix well. Stir in the whole wheat flour, one cup at a time, until a stiff dough as formed. Transfer the dough to a lightly floured surface and knead, adding additional flour if necessary, until the dough is smooth and no longer sticky. Divide the dough in half. Working with one half at a time, roll the dough out with a rolling pin to ½-inch thickness. 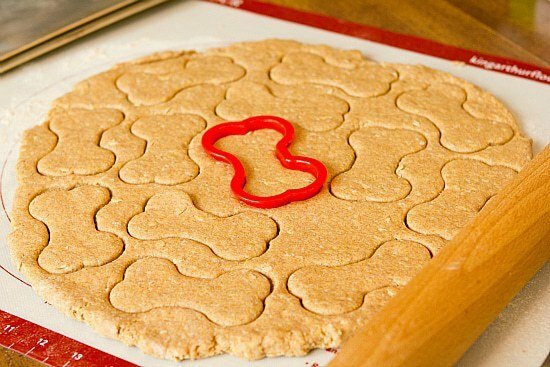 Cut with a cookie cutter and space evenly on the prepared baking sheets. Re-roll the remaining dough scraps and continue cutting until all the dough as been used. Bake 35-45 minutes, until golden brown. Remove to wire racks to cool completely. I don’t have cornmeal, would I be able to bake this without it? Hi Corey, You can still make them; I would just use extra flour. I was wondering how long the dough is good for in the fridge and if it can be frozen? I made a double batch but didn’t have time to use it all. 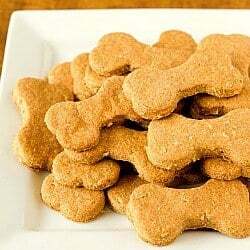 My dogs love these treats. I work at a veterinary clinic and bring them to work to give to our furry visitors too. It’s so much better when you know what goes into your dogs treats and more cost effective. Can i substitute honey for granulated sugar? Hi Caitlyn, Sure! I don’t see why not! I’m in Australia. What is cornmeal please? Cornmeal is a course flour ground from dried corn. 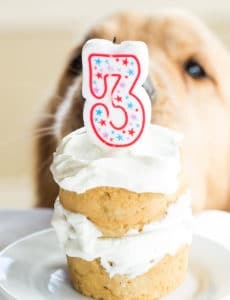 I know this is a late comment…I can’t wait to make these for my Ruger’s 2nd birthday. My all-time favorite book is Watchers by Dean Koontz. Is your baby named after the awesome dog in that book? It has always been my understanding (from our vet) that anything with corn, or corn meal (grains in general, so this includes the wheat flour as well) is bad for our dogs. They can not process it like we do, and therefor it will cause diarrhea and other intestinal issues. On a side note, he is adorable! I see that you use Beef bullion? doesn’t that contain onions and garlic? if so then you shouldn’t be using that as it’s poisonous to dogs and can be fatal! People should read up on the ingredients before posting a recipe containing it to the masses. Thanks for the recipe! I’ve made them twice now and my puppy loves them! I just bought some animal-shaped cookie cutters at Ikea too, so right now she is enjoying squirrel-shaped cookies! A Belated Happy 6th Birthday to Einstein! I was wondering if you had any idea how long these would last? I’m sure they typically get eaten before it becomes an issue, but I was wondering how long they would still be good. Does the cheese in them shorten the shelf life? Sidenote-, I think this is my first comment but I have been following you for over a year and love the blog! My husband is originally from Pittsburgh and I told him that I think you are actually his perfect woman ;) (bakes, loves the Penguins and the Steelers). He even made me secretly stash a cookie with the Steelers logo on it in a box of cookies for a 13 year old boy that like the Ravens. Thanks for any tips on the dog treats! So funny about the cookies! 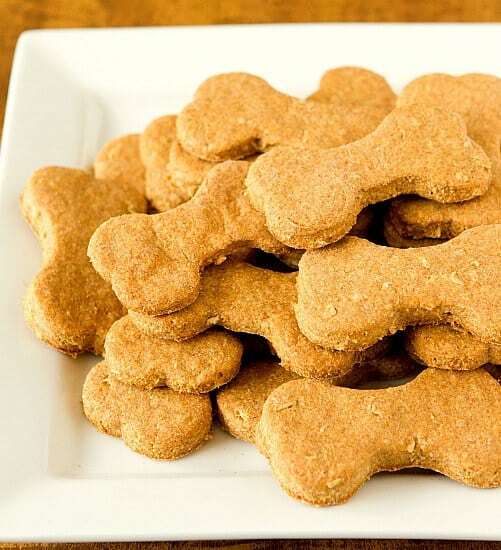 As for these dog treats, I would say about a week or so. If you make them smaller and overbake them a bit, they’ll last longer than if they are larger and softer. 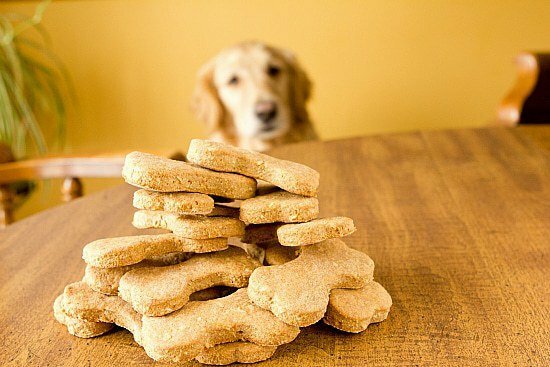 I’m always looking for easy to make recipes for treats for my 3 dogs. If anyone has some that do not have any corn products (e.g. cornmeal) I would love to see them. Thank you to all for posting here. I enjoy it. Michelle, these look fabulous! I’m curious if these would work without the beef bouillon. One of my dogs has chronic hepatitis so she’s on a very low-protein diet. I’m always looking for vegetarian treats for her and was thinking I could try these without the beef bouillon. Thoughts? Hi Ana, Sure, that just gives them the flavor. You could also look for vegetable bouillon and use that! Sounds yummy, but I try to eliminate corn and wheat from my dogs’ diets……. 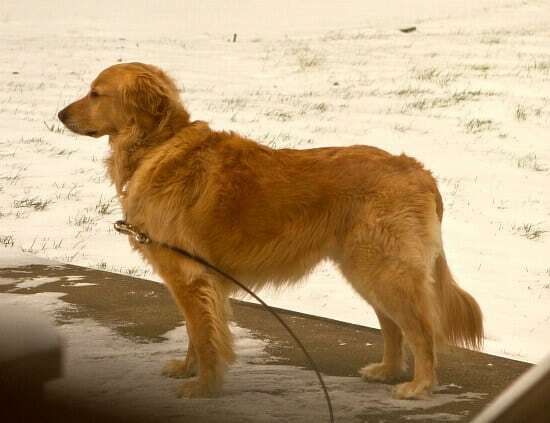 I just found your blog today as I was looking for a birthday cake recipe for my golden retriver , named Shasha. She look just like your. Einstein looks soooo adorable!!!. I have a question. How you manage his sheding of hair….. I found it quit difficult to keep the place clean> Shasha shed hair quit a bit!!!!!! How do you manage? Hope you could help. Hi Shanta, Happy Birthday to Shasha! Unfortunately I have no tips about shedding management, I’ve just learned to accept that I need to vacuum often ;-) The last two times he’s been groomed I’ve had them do an anti-shedding treatment and it seems to help for the first week or two. Thanks for your input. Here we are currently vaccuming every other day and besides this my husband brushes him down in the morning as well as the evening….I guess we have to learned to accept it too…..right!!!! Thanks again for you input!!! you have a lovely blog here…keep up!!!! 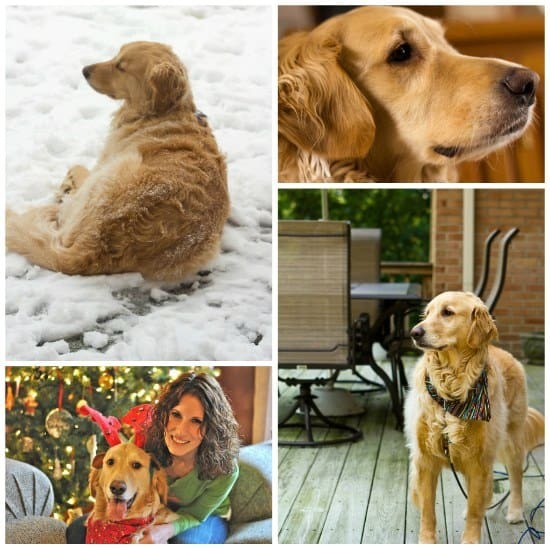 My dog needs gluten free treats….any suggestions for an alternative to the flour? Hi Deanna, What about using rice flour? do we know how long they are good for? Love this– awesome images, easy to follow, great recipe. Thanks for sharing. would love to feature you in our cookbook that we will be distributing to new subscribers and customers. these look yummy. I cannot wait to make these for our new puppy! This post is adorable. 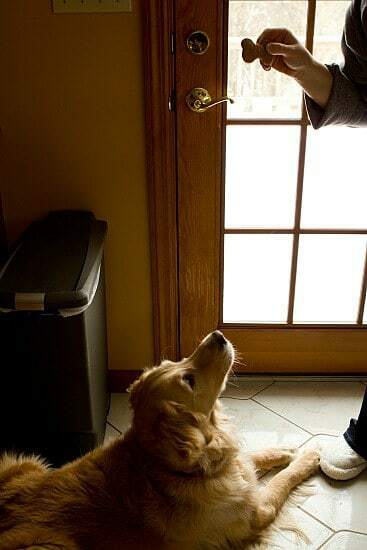 I love the “hurry up and give me treats!” photo. These are great! 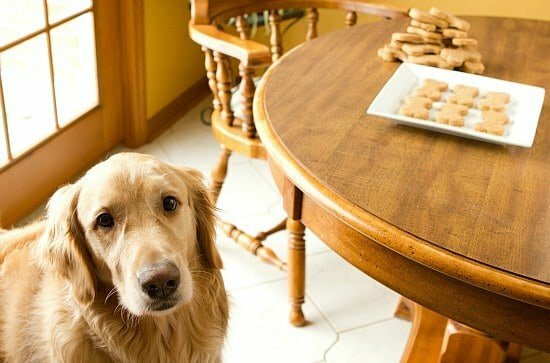 My bf just got a dog and he’s been nagging me to bake him something :) thanks for the recipe! I just found your blog today as I was looking for a birthday cake recipe for my wiener dog, Stanley. 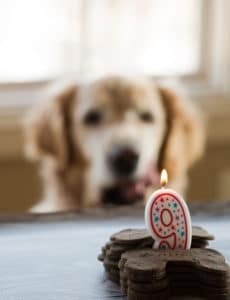 He turned 7 years old today and enjoyed the cake with peanut butter icing shaped like a bone. Your Einstein is a beautiful dog and I want to wish him a Happy belated Birthday. 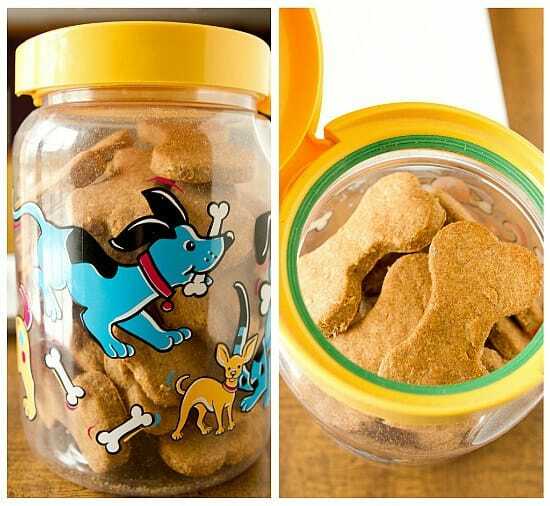 I need to make some of these dog treats for Stanley. Looking forward to trying some of your human recipes. I love making treats for my two dogs, and Einstein sure looks like he’s in doggy heaven. I do have one small criticism, which is the amount of cheese, which is unnecessary fat. The recipe I use for puppy cookies uses a meat flavored baby food and a tablespoon of vegetable oil. Additionally, the cornmeal isn’t something dogs can really use nutritionally, and some dogs have allergies to it. Up the whole wheat flour instead. What a great birthday treat! My little guy’s birthday is in a couple weeks, and I know he’d love these! Goody Goody Bars which I made last week. 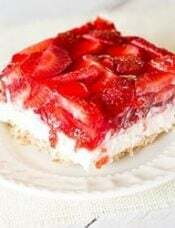 ( Yummmm.) I get the chocolate topping and she gets the rest. Inbetween smacking her choppers, she wants to wish Einstein a very HAPPY BIRTHDAY! Love, love, LOVE this one! Happy Birthday to Einstein and what a nice treat! The photos are absolutely precious! BRAVO!